President George W. Bush is greeted by U.S. Ambassador Sandy Randt upon his arrival Friday, Aug. 8, 2008, at the U.S. Embassy in Beijing. With them are former President George H.W. 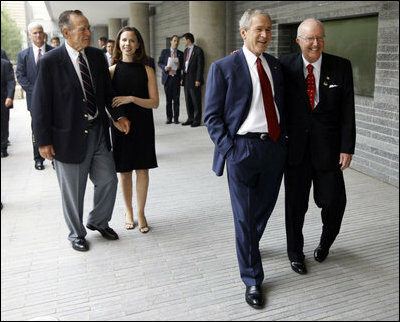 Bush and Ms. Barbara Bush.